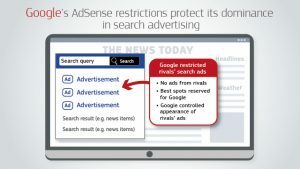 Between 2006 and 2016, Google imposed to several third-party websites a number of restrictive clauses in contracts which prevented Google’s competitors from placing their search adverts on these websites. This is made clear from the European Commission’s survey started on July 2017 and extended for over two years. Through the platform AdSense for search, Google provides adverts linked to user’s web search to website owners that want to profit from the space around their search results pages, acting as an intermediary between website owners (“publisher”) and advertisers. Some websites offer a search box that allows users to search for information. Whenever a user enters a search query, in addition to the search results, also search advertisements are displayed. If the user clicks on the search advertisement, both Google and the third party receive a commission. At first, exclusivity clauses. 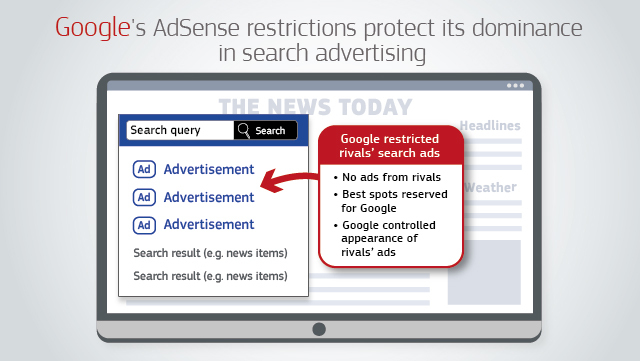 This meant that publishers using AdSense for search were prohibited from placing any search adverts from Google’s competitors on their search results pages. Subsequently, Google replaced the exclusivity clauses with clauses that required publishers to reserve the most profitable space on their search results pages for Google’s adverts and request a minimum number of Google adverts. As of March 2009, Google also included clauses requiring publishers to seek written approval from Google before making changes to the way in which any rival adverts were displayed. This meant that Google could control how attractive competing search adverts could be. As a result of the misconducts described, Google’s competitors were prevented from placing their search adverts in the most visible and clicked on parts of the websites’ search results pages. These practices didn’t go unnoticed to European Institutions, and on July 14, 2016 the European Commission decided to initiate an antitrust proceeding against Google within the meaning of Article 11(6) of Council Regulation No 1/2003 and Article 2(1) of Commission Regulation No 773/2004, and, eventually, declared the above examined practices an infringement of EU Antitrust Law. Article 102 of the Treaty of functioning of the EU (T.F.E.U.) forbis “Any abuse by one or more undertakings of a dominant position within the internal market or in a substantial part of it (…) as it may affect trade between Member States” and lists some conducts to be considered “abusive”, as, for example, “imposing unfair trading conditions”. The mentioned provision does not ban the detention of a dominant position. Market dominance is, as such, not illegal under EU antitrust rules. However, dominant companies have a special responsibility not to abuse their powerful market position by restricting competition, so the conduct of the company with dominant position must not conduct to “impair genuine undistorted competition on the common market.” (CGUE, C-322/81, judgement November 9, 1983, in curia.europa.eu). In the case examined by EU Commission, there’s no doubt Google is a dominant company in the market for search advertising intermediation in the European Economic Area (EEA), with market shares of around 85% in the period examined. This is a consequence of the fact that the market is characterised by high barriers to entry. These include very significant initial and ongoing investments required to develop and maintain general search technology and a sufficiently large portfolio of both publishers and advertisers. According to the EU Commission, by imposing the restrictive clauses described, Google, by artificially restricting the possibility of third party websites to display search advertisements from its competitors, interfered the competition and restricted the ability of Google’s rivals to insert their advertisement on third-party websites and their ability to offer the public alternative services to the ones provided by Google. As a consequence, the publisher website was forced to rely almost solely on Google’s services. These kinds of abusive practices suffocated the consumer’s choices and innovation. That, taking account of the duration and gravity of the infringement. This is the third fine imposed on Google as a result of a breach of EU antitrust law. Commissioner Vestager observed that “Google has come up with many innovative products that have made a difference to our lives. But that doesn’t give Google the right to deny other companies the chance to compete and innovate.”. Who knows if the web titan, despite its undeniable dominance in the market, will start pay more attention to EU Antitrust law.